Egypt. "Aegyptus Antiqua". Orig. copper-engraving, A. Ortelius, Antwerp, 1584. Orig. old colouring. With 3 decorative cartouches (one with inset map of Alexandria with its environs, 8,5:11 cm) and great architectural cartouche with 2 pyramids. Printed from two plates, not joined. 79,5:49 cm (31 1/4 x 19 1/4 inch.). V. d. Broecke Nr. 219 und 220; Koeman III, maps 8650H/1:31A and 8650H/2:31A, ed. 31:030 (1584 Latin). 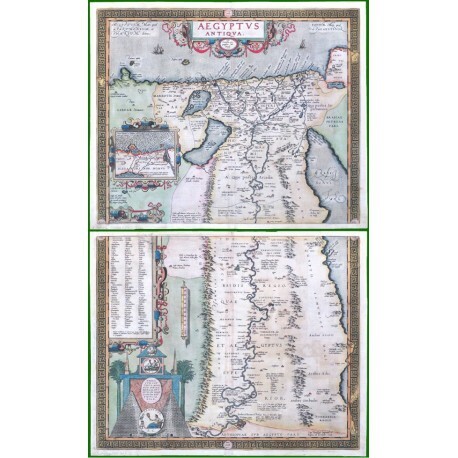 - A very decorative Ortelius' two sheet map of Ancient Egypt, extending from the mouth of the Nile to the Mediterranean Sea in the North to the source of the Nile in the South. - Two sheets with full margins, not joined.